Data show that the global average surface temperature in July was 61.86oF, breaking the 1998 record by 0.14 degrees. Nineteen ninety-eight was the year of the last huge El Niño event, and most forecasts predict a similarly large event this year. El Niños tend to raise worldwide temperatures, and also to create mischief in places like California, parts of which haven’t received rain in a very long time. El Niño rains in California often double the normal annual rainfall—all falling in a few weeks, with storm after soupy storm drenching the state. This deluge leads to landslides. The gigantic Mission Peak Landslide above Fremont initiated after the 1998 El Niño rains, and the slide has been awaiting the next deluge to move downhill toward a number of homes. 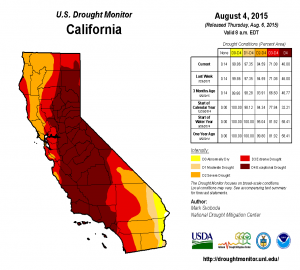 Epic drought or unmanageable rainfall—California just can’t seem to catch a break. But the bad news for California just keeps coming: NASA reports that the ground in parts of the state is sinking as rapidly as two inches per month. No, I didn’t mistype that: two inches per month. With the ground plunging on the order of two feet per year, soon roads and home foundations and infrastructure, such as the California Aqueduct, will start to crack and deform. This ground sinking—also known as subsidence—happens when farmers pump water out of aquifers to irrigate their crops. That formerly-trapped underground water acted as an incompressible fluid to support deeply-buried sediment layers from the crushing weight of everything on top of them. Remove that water and you remove the support for those layers. Imagine poking a hole in a waterbed then having a bunch of people jump on the mattress. Normally, farmers receive an allotment of irrigation water, but California’s epic drought has so curtailed these water deliveries that the agricultural industry increasingly relies on groundwater pumping. The state has not traditionally regulated or even measured this sort of pumping (and you thought California regulated everything!). Now so much water is being pumped that subsidence is happening at a staggering rate. Record-breaking temperatures. El Niño storms and landslides. Epic drought. Rapid land subsidence. California has always been a land with plenty of drama, but human activities are making the Golden State even more extreme. According to a new paper published in Geophysical Research Letters, anthropogenic climate change has made the current California drought 15-20% worse than it would otherwise have been. Periods of drought and intense rain have long characterized California’s hydrology, but now it’s as if the craziness has been turned up to 11. Moreover, as the Geophysical Research Letters article found, climate change is doubling the risk of California droughts as severe as the current one. We can’t do anything about some problems afflicting the planet, such as the Kardashians still having a reality TV show. But climate problems we bring on ourselves.